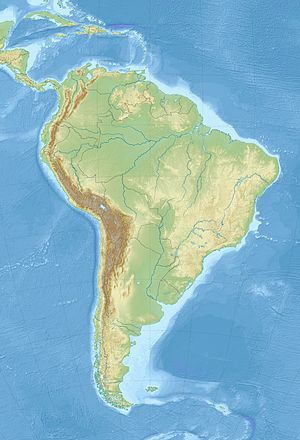 The Mustersan age is a period of geologic time (48.0—42.0 Ma) within the Eocene epoch of the Paleogene, used more specifically within the South American land mammal age (SALMA) classification. It follows the Casamayoran and precedes the Divisaderan age. This age is named after Lake Musters in the Golfo San Jorge Basin. Woodburne, M.O. ; F.J. Goin; M. Bond; A.A. Carlini; J.N. Gelfo; G.M. López; A. Iglesias, and A.N. Zimicz. 2013. Paleogene Land Mammal Faunas of South America; a Response to Global Climatic Changes and Indigenous Floral Diversity. Journal of Mammalian Evolution 21. 1–73. Accessed 2019-02-15. Acosta Hospitaleche, Carolina, and Claudia Tambussi. 2005. Phorusrhacidae Psilopterinae (Aves) en la Formación Sarmiento de la localidad de Gran Hondonada (Eoceno Superior), Patagonia, Argentina [Phorusrhacidae Psilopterinae (Birds) in the Sarmiento Formation from the Gran Hondonada locality (Upper Eocene), Patagonia, Argentina. Revista Española de Paleontología 20. 127–132. Accessed 2018-09-10. Dozo, María Teresa; Martín Ciancio; Pablo Bouza, and Gastón Martínez. 2014. Nueva asociación de mamíferos del Paleógeno en el este de la Patagonia (provincia de Chubut, Argentina): implicancias biocronológicas y paleobiogeográficas. Andean Geology 41. 224–247. Accessed 2017-08-15. Pérez, María Encarnación; Marcelo Krause, and María Guiomar Vucetich. 2012. A new species of Chubutomys (Rodentia, Hystricognathi) from the late Oligocene of Patagonia and its implications on the early evolutionary history of Cavioidea sensu stricto. Geobios 45. 573–580. Accessed 2019-02-15. Shockey, Bruce J.; John J. Flynn; Darin A. Croft; Phillip Gans, and André R. Wyss. 2012. New leontiniid Notoungulata (Mammalia) from Chile and Argentina : comparative anatomy, character analysis, and phylogenetic hypotheses. American Museum Novitates 3737. 1–64. Accessed 2019-02-15. Sterli, Juliana; Marcelo S. De la Fuente, and J. Marcelo Krause. 2015. A new turtle from the Palaeogene of Patagonia (Argentina) sheds new light on the diversity and evolution of the bizarre clade of horned turtles (Meiolaniidae, Testudinata). Zoological Journal of the Linnean Society 174. 519–548. Accessed 2019-02-13. Wyss, André R.; John J. Flynn, and Darin A. Croft. 2018. New Paleogene notohippids and leontiniids (Toxodontia; Notoungulata; Mammalia) from the Early Oligocene Tinguiririca Fauna of the Andean Main Range, central Chile. Journal of South American Earth Sciences 3903. 1–42. Accessed 2019-02-11. Bertrand, Ornella C.; John J. Flynn; Darin A. Croft, and André R. Wyss. 2012. Two new taxa (Caviomorpha, Rodentia) from the early Oligocene Tinguiririca fauna (Chile). American Museum Novitates 3750. 1–36. Accessed 2019-02-15. Bradham, Jennifer; John J. Flynn; Darin A. Croft, and Andre R. Wyss. 2015. New notoungulates (Notostylopidae and basal toxodontians) from the early Oligocene Tinguiririca fauna of the Andean Main Range, central Chile. American Museum Novitates 3841. 1–24. Accessed 2019-02-13. Croft, Darin A.; John J. Flynn, and André R. Wyss. 2008. The Tinguiririca fauna of Chile and the early stages of "modernization" of South American mammal faunas. Arquivos do Museu Nacional, Rio de Janeiro 66. 191–211. Accessed 2019-02-12. Engelman, Russell K.; John J. Flynn; Philip Gans; André R. Wyss, and Darin A. Croft. 2018. Chlorocyon phantasma, a late Eocene borhyaenoid (Mammalia, Metatheria, Sparassodonta) from the Los Helados locality, Andean Main Range, central Chile. American Museum Novitates 3918. 1–22. Accessed 2019-02-11. Godoy, Estanislao. 2012. Sobre el variable marco geotectónico de las formaciones Abanico y Farellones y sus equivalentes al sur de los 35°LS. Revista de la Asociación Geológica Argentina 69. 570–577. Accessed 2017-08-15. Muñoz, Marcia; Francisco Fuentes; Mario Vergara; Luis Aguirre; Jan Olov Nyström; Gilbert Féraud, and Alain Demant. 2006. Abanico East Formation: petrology and geochemistry of volcanic rocks behind the Cenozoic arc front in the Andean Cordillera, central Chile (33°50'S). Revista Geológica de Chile 33. 109–140. Accessed 2017-08-15. Goin, Francisco J.; Marcelo F. Tejedor; Laura Chornogubsky; Guillermo M. López; Javier N. Gelfo; Mariano Bond; Michael O. Woodburne; Yamila Gurovich, and Marcelo Reguero. 2012. Persistence of a Mesozoic, non-therian mammalian lineage (Gondwanatheria) in the mid-Paleogene of Patagonia. Naturwissenschaften 99. 449–463. Accessed 2019-02-15. Tejedor, Marcelo F. et al. 2009. New Early Eocene Mammalian Fauna from Western Patagonia, Argentina. American Museum Novitates 3638. 1–43. Accessed 2018-09-11. Chacaltana, César; Alexandra Lucytania Benites Cañote; Waldir Valdivia, and Marco Chumpitaz. 2014. La formación Chota en la Cuenca Bagua: Evaluación e implicancias del criterio de clasificación litoestratigráfico, 1–4. Congreso Peruano de Geología. Accessed 2017-08-15. Ciancio, Martín R; Claudia Herrera; Alejandro Aramayo; Patricio Payrola, and Judith Babot. 2016. Diversity of cingulate xenarthrans in the middle–late Eocene of Northwestern Argentina. Acta Palaeontologica Polonica 61. 575–590. Accessed 2018-09-10. García López, D.A., and M.J. Babot. 2014. Notoungulate faunas of north-western Argentina: new findings of early-diverging forms from the Eocene Geste Formation. Journal of Systematic Palaeontology 13. 557–579. Accessed 2019-02-12. López, Guillermo, and Mariano Bond. 1995. Un nuevo Notopithecinae (Notoungulata, Typotheria) del Terciario Inferior de la Puna argentina [A new Notopithecinae (Notoungulata, Typotheria) of Lower Tertiary from the argentinian Puna]. Stvd. Geol. Salmant. 31. 87–99. Accessed 2018-09-10. Clarke, Julia A.; Daniel T. Ksepka; Marcelo Stucchi; Mario Urbina; Norberto Giannini; Sara Bertelli; Yanina Narváez, and Clint A. Boyd. 2007. Paleogene equatorial penguins challenge the proposed relationship between penguin biogeography, body size evolution, and Cenozoic climate change. Proceedings of the National Academy of Sciences 104. 11545–11550. Accessed 2017-08-15. Antoine, P.O. ; L. Marivaux; D.A. Croft; G. Billet; M. Ganerod; C. Jaramillo; T. Martin; M. Orliac, and J. Tejada, A. J. Altamirano, F. Duranthon, G. Fanjat, S. Rousse and R. Salas Gismondi. 2011. Middle Eocene rodents from Peruvian Amazonia reveal the pattern and timing of caviomorph origins and biogeography. Proceedings of the Royal Society B 279. 1319–1326. Accessed 2019-02-14. Boivin, Myriam; Laurent Marivaux; Maëva J. Orliac; François Pujos; Rodolfo Salas Gismondi; Julia V. Tejada Lara, and Pierre-Olivier Antoine. 2017. Late middle Eocene caviomorph rodents from Contamana, Peruvian Amazonia. Palaeontologia Electronica 20. Article number 20.1.19A. Accessed 2019-02-12. Carlotto, Víctor. 2016. Dataciones por trazas de fisión en los depósitos continentales terciarios de la Región de Cusco, 521–524. XIII Congreso Peruano de Geología. Accessed 2017-08-15. Montalvo, C., and M. Bond. 1998. Un notoungulata de la Formación Vaca Mahuida (Eoceno), provincia de La Pampa, Argentina. Asociación Paleontológica Argentina, Publicación Especial 5. 55–60. Accessed 2019-02-15. Petrulevicius, J.F., and Y.A. Popov. 2014. First fossil record of Discocephalinae (Insecta, Pentatomidae): a new genus from the middle Eocene of Río Pichileufú, Patagonia, Argentina. ZooKeys 422. 23–3. Accessed 2019-02-22. Wilf, P.; K.R. Johnson; N.R. Cúneo; M.E. Smith; B.S. Singer, and M.A. Gandolfo. 2005. Eocene Plant Diversity at Laguna del Hunco and Río Pichileufú, Patagonia, Argentina. The American Naturalist 165. 634–650. Accessed 2019-02-22. Bond, Mariano; Marcelo F. Tejedor; Kenneth E. Campbell Jr.; Laura Chornogubsky; Nelson Novo, and Francisco Goin. 2015. Eocene primates of South America and the African origins of New World monkeys. Nature 520. 538–546. Accessed 2017-09-24. Campbell, K.E. ; C.D. Frailey, and L. Romero Pittman. 2004. The Paleogene Santa Rosa Local Fauna of Amazonian Perú: Geographic and Geologic Setting. Natural History Museum of Los Angeles County, Science Series 40. 1–164. Accessed 2019-02-15. Ciancio, Martín Ricardo; Alfredo A. Carlini; Kenneth E. Campbell, and Gustavo J. Scillato Yané. 2013. New Palaeogene cingulates (Mammalia, Xenarthra) from Santa Rosa, Perú and their importance in the context of South American faunas. Journal of Systematic Palaeontology 11. 727–741. Accessed 2019-02-15.